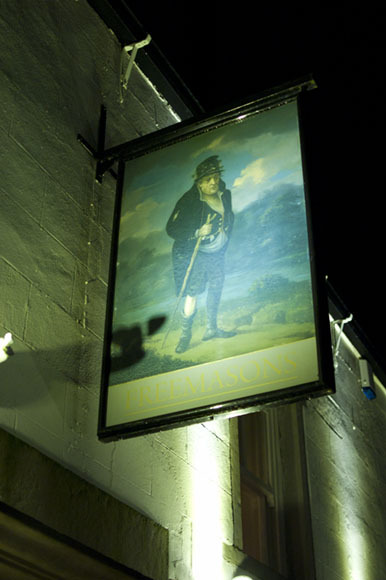 Bacon on the beech: Freemasons at Wiswell. I'm always late to the party. I start a food blog about three years too late just as food critics are rounding up on them. I finally end up going to restaurants bloggers have all raved about three months later. I've still not managed to get in at the Fat Duck, just as critics have said it's getting a bit same-y and not moved on. So it was that we drove up from Manchester in the rain early one Friday evening to the Freemasons at Wiswell. I was determined not to be late on this one. I'd read about this place whilst looking at restaurants not too far for me to drive to, that are in the Michelin Guide, but as yet don't have any stars. The food on the website looked amazing. There had been a few amateur reviewers giving glowing reports but not too many as far as I could tell. In truth we weren't in the mood. Mrs Bacon had had a hard final week at work after taking exams and I'd got the dull remnants of a hangover from last nights Folk train to Glossop. We got there early. 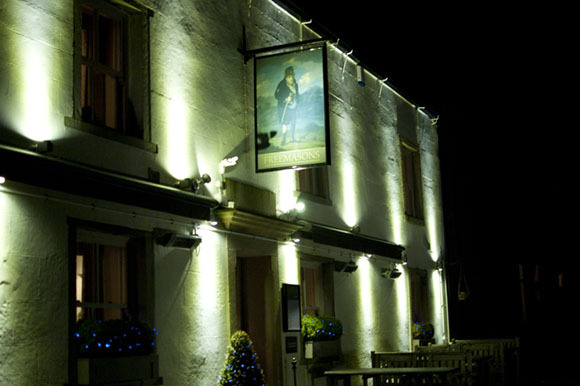 It's beautiful inside, just as a country pub should be. Small little rooms all leading into the bar area. It was very early evening so there were few people apart from us. We were shown to our table, there was quite a long wait until any food arrived. To be fair we'd arrived an hour early, but it would have been nice if they'd have told us when service was starting. They bought us some sour-dough bread. It was ok, but a choice of maybe three types of bread would have been better. Perhaps I'd better not expect high end food, it is a pub after all I thought. They showed us the upstairs private dining rooms you can rent for free for small parties, it looked beautiful and opulent. The stag heads and foxes head would have put off a few of our animal loving friends, but we loved it! 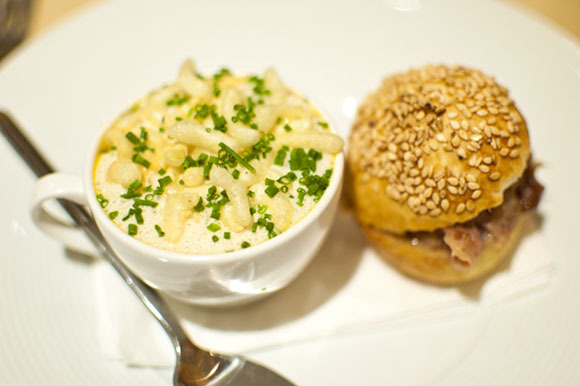 The first course was Pumpkin & Parmesan Soup, & A Pulled Pork Sandwich. It looked great, a tiny cup with a baby sized sandwich next to it. I really liked it, the soup was nice and tangy, the pulled pork lovely and juicy. Mrs Bacon was not overly impressed, she thought whilst nice, it lacked the wow factor like the soup we had at Aumbry not so long ago. She wanted that creamy luxuriousness which it lacked. Next, Beetroot; Salt Baked, Blue Cheese, Orange and Walnut. Now I pride myself on eating just about everything, I can't bear fussy eaters, for me they've just not grown up properly like the rest of us (I was actually a fussy eater as a child.) However Beetroot is not at the top of my list of favourite foods. Funny that, as every Michelin star meal we've had recently has had at least one course with beetroot in! 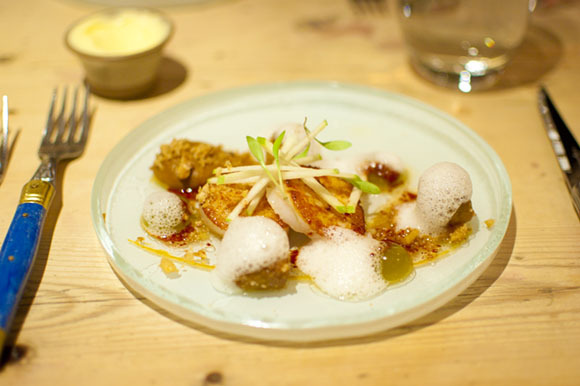 (Including L'Enclume, Northcote, Marcus Wareing at the Berkeley and the aforementioned Aumbrey) This dish looked beautiful. I liked it despite my ambivalence towards beetroot. Mrs Bacon however was going to be very hard to overly impress tonight. Although she thought the beetroot sorbet genius. 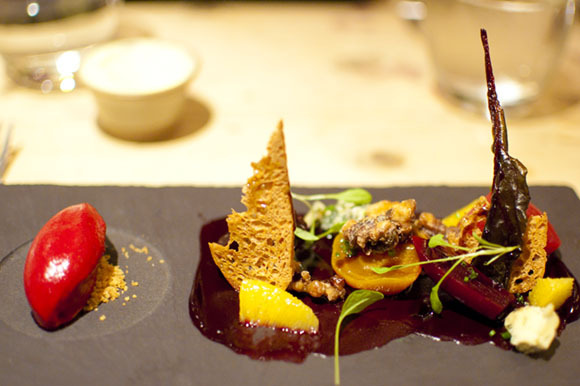 Beetroot; Salt Baked, Blue Cheese, Orange and Walnut. Next was an extra course, I think it was Hay Smoked Pheasant, Shaved Chestnut and Winter Truffle in a little jar on the side. Good, but again lacked that Michelin star quality for me. Perhaps we'd been spoilt of late and expected more. This was very good food indeed, and we were in a pub! 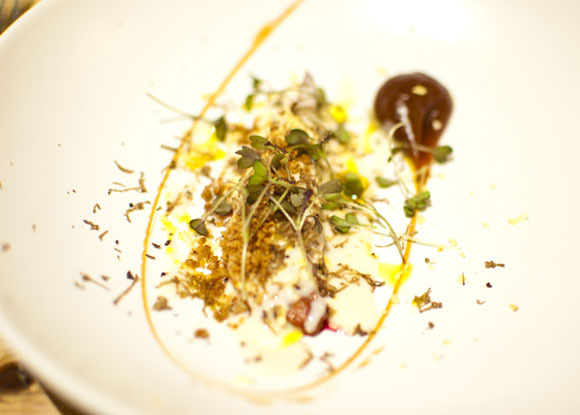 Hay Smoked Pheasant, Shaved Chestnut and Winter Truffle. Monk Fish poached in brown butter, pork belly, onion and piccalilli came. The monk fish was beautifully tender and the piccalilli element was good although a little over powering. The Pork belly was gorgeous, juicy and tender. Although my wife thought that a crackling topping would have made it even better. 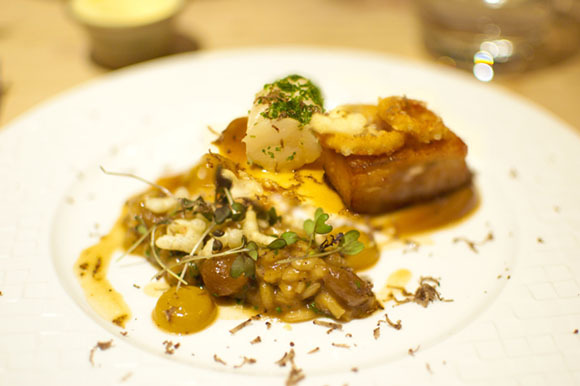 Monk Fish poached in brown butter, pork belly, onion and piccalilli. The next course Hand Dived Scallops Tandoori Roast, Pig’s Trotter Nuggets, Pumpkin, Apple and English Wasabi was very good. I thought this a Michelin star dish, the scallops perfect, delicate and tender, but neither of us were sure if the English Wasabi (more like a curry flavour) was necessary. 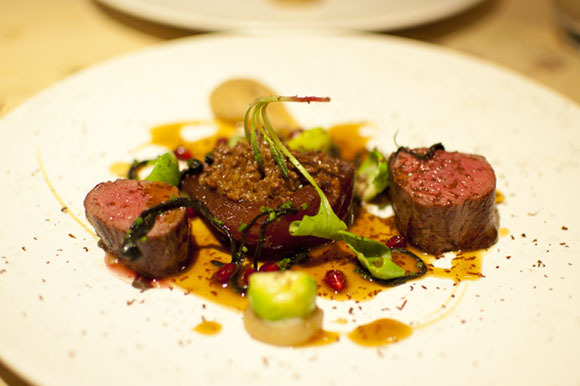 For mains Venison Loin and Bolognaise, Mulled Pear and Celeriac, Smoked Chocolate and Pomegranate. The bolognaise in the pear really worked and like everything else we ate that night, the presentation was perfection. This reached a new level when desserts came. Mandarin; Dark Chocolate, Honey and Pistachio was great fun with the addition of space dust which is always a winner in my eyes. Two really great puddings I thought. 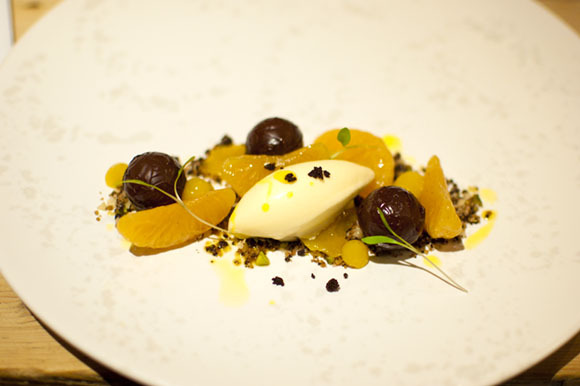 Mandarin; Dark Chocolate, Honey and Pistachio. So to conclude, the food here varies between the best pub food you're likely to eat (round these parts anyway) and Michelin Starred greatness. We noticed a lot of locals eating off the a la carte, I'm not sure how many taster menus are sold in comparison. 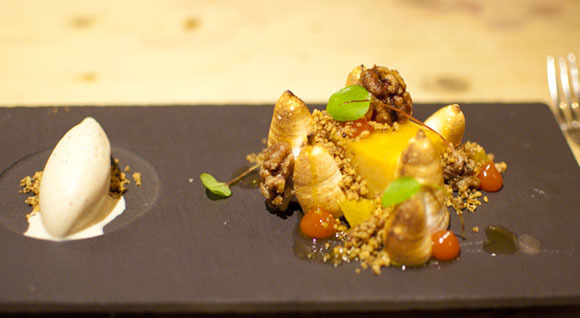 You cannot afford to scare off your core business with food too outlandish after all. If you do judge it by pub standards, it's pretty much top level. If you judge it by nearby Michelin star Northcote, it's just very slightly underneath. But it is £25 cheaper for a taster menu here, you pay your money you take your choice. I can't put my finger on it, everything looked amazing, but some of the food just didn't smell like Michelin star food; yet. Some of the sauces and elements didn't have that flavour so intense like you would get high end restaurants like L'Enclume. But that is being quite unfair. His food can only get better and more refined. Whether the highest accolades will be at The Freemasons or not I don't know. I hope so. We really enjoyed eating there and the food of a very talented chef and future star. And we'll have the petty satisfaction of being able to say we were there at the beginning! We paid £134.50 for 2 7 Course Taster Menus half a bitter & three glasses of wine. Excellent value for food of this type. Service: Very Friendly, the waitresses were all very sweet. 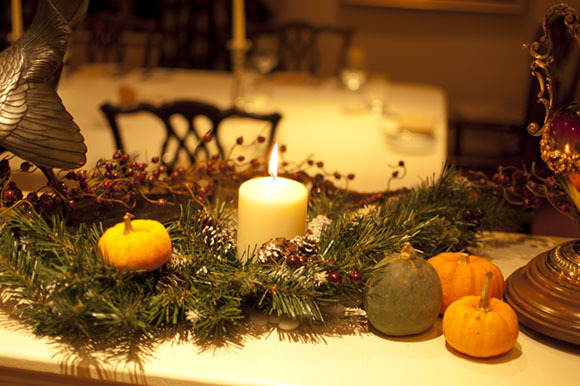 Atmosphere: Cosy warm & inviting. Star dish: Blood orange Meringue Pie. I'm with you on the beetroot!! Aldi 1973 Vintage Bordeaux Napoleon Brandy. Little Black Bomber at the Christmas markets. Local Heroes: J Robinson Butchers.